Leaders extol the value of pursuing challenging goals, but evidence suggests that this leads to disaster as often as success. 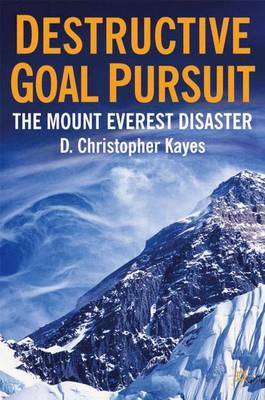 Drawing upon real-life stories, including the Mount Everest Climbing Disaster, the author shows how destructive goal pursuit can cause the breakdown of learning in teams and calls for rethinking the role of the leader. 'This book takes the concept of learning from experience in a new, although not completely unfamiliar direction. The events serve as a rich example of how learning from experience is central to leadership success in dynamic environments. By identifying the negative and potentially disastrous consequences of the non-reflective pursuit of ambitious goals, this book offers a sage warning to those of us who live in a culture where high goals are a praiseworthy status symbols and relentless pursuit of them a sign of moral superiority. The book reflects a growing problem that can be seen in many different situations. Leaders who set high goals and pursue them regardless of the consequences are seen as principled, while the leader who learns from experience and modifies goals accordingly runs the risk of being seen as wishy-washy.' David Kolb, author, 'Experiential Learning: Experience as the source of Learning and Developmen't and Professor of Organizational Behavior, Case Western Reserve University. Alice Kolb, President, Experience Based Learning Systems, Inc.